Tam Hunt, J.D. owns and runs Community Renewable Solutions LLC, a renewable energy consulting and project development company. 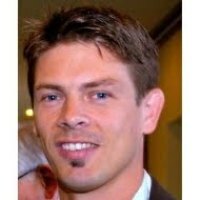 Hunt is a renewable energy law and policy expert with substantial experience in California on local energy planning and on state policy. He is also a lecturer in Climate Change Law and Policy at UC Santa Barbara’s Bren School of Environmental Science & Management (a graduate-level program). Hunt was the lead author of the Community Environmental Council’s A New Energy Direction, a blueprint for Santa Barbara County to wean itself from fossil fuels by 2030. 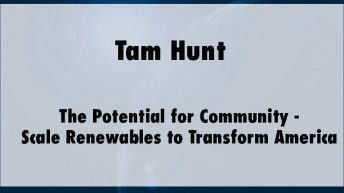 Hunt works with local governments in southern California and also contributes substantially to state policy, in Sacramento at the legislature and, in particular, in San Francisco at the California Public Utilities Commission, in various proceedings related to community-scale energy projects, climate change policy, and energy efficiency. He received his law degree from the UCLA School of Law in 2001, where he was chief managing director of the Journal for International Law and Foreign Affairs. Hunt is a regular columnist at Renewable Energy World and EnergyPulse.